● using SRPP circuit for pre-plus differential voltage amplification, so that the machine wide frequency response, distortion, sound better. ● pre-direct coupled circuit for the whole structure and to promote the long-tail-type inverter circuit. 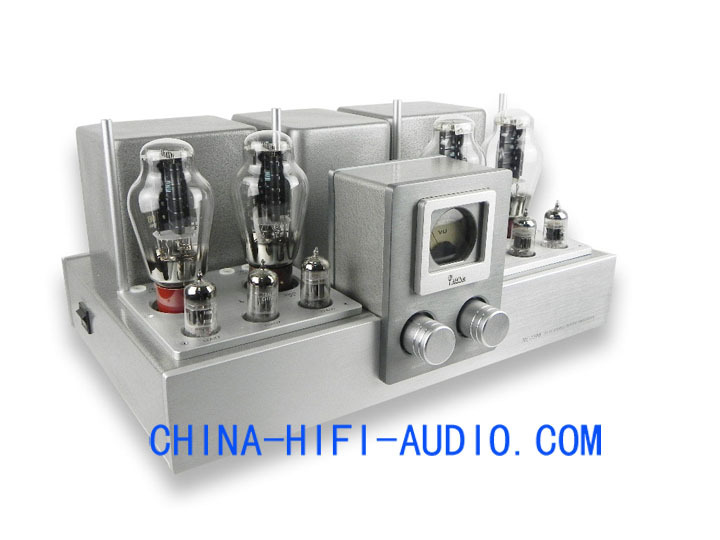 ● A push-pull power stage as a way to make low-frequency drivers foot, better sound quality. ● High delayed start, can effectively extend the life of the bile duct and the VU meter for volume instructions. ● Audio output transformer dedicated silicon steel imported from Japan, Z11 (0.35mm thick) and oxygen-free copper enameled wire and special high-strength multi-layer hierarchical grouping of the winding process production, so that the machine wide frequency response 5Hz-73kHz (-2dB ) (according to national standard measurement method), to ensure that the local high, middle and low-frequency sound good, transparent and powerful. ● The machine used in all foreign names sound factory dedicated enthusiast electrolytic capacitors, polarity Philips (MKP) capacitors and manufacturing high-quality gold blocking the main channel use of imported special large volume potentiometer, with a musical background quiet, low noise, no coloration and durable and so on.